Jezebel wines are produced by Daedalus Cellars with the intent of providing wine that is well-balanced, interesting and designed for immediate consumption. 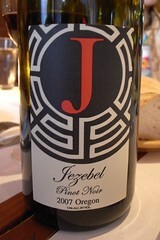 The 2007 Pinot Noir is a blend of wine from several Oregon vineyards. The fruit was cropped around two to three tons per acre, fermented in small lots, and blended to produce a wine that is fruit-forward, well-balanced and surprisingly complex. This particular vintage produced wines that are classically elegant in style with the structure and elegance to make them excellent food wines. The wine should pair well with salmon, chicken and mushrooms. It should be enjoyable upon release, but it may also cellar well for five to six years.